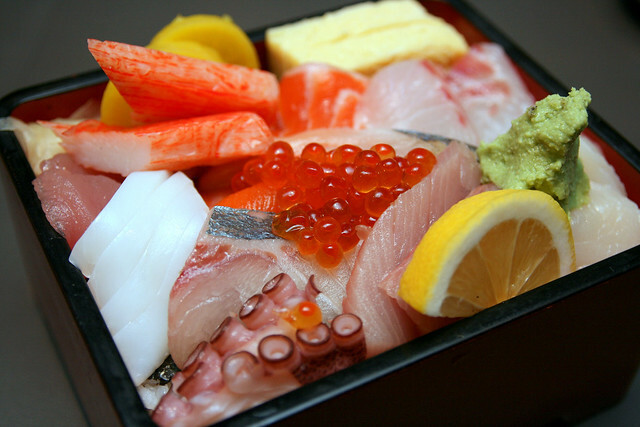 Kaiho Sushi is one of the better-known places for good Japanese food at Cuppage Plaza. It is particularly popular for its lunch sets. Here's the luscious Chirashi Sushi set. It features some nine varieties of whole slices of fresh seafood, not chopped odds and ends. Plus tamago-yaki, pickles and gorgeous gari on a bed of lovely Japanese steamed rice. Not pictured here is the freeflow green tea, the supremely light and smooth chawanmushi (with a tasty cut of unagi embedded within), the miso soup, and scoop of ice cream or sorbet (I chose yuzu, of course). Prices have risen from S$25++ to S$28++ for the lunch sets, but for the quality of ingredients, they are still a good deal. Any idea on whether the Dinner service also has comparable value? Lunchtime a bit inconvenient to go, can only really visit for dinner. Timing: Sadly no. Dinner is usually twice the price and above for other sets. Hmm, forgot to ask if lunch sets are also available weekends but you can call to ask. I don't know why i can't eat a "real" sushi. i mean i can only eat sushi if it slighty cooked. hehe.